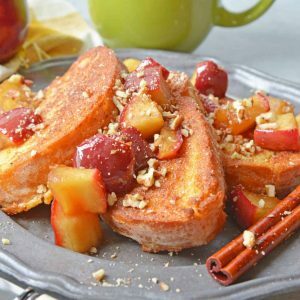 Apple Cinnamon French Toast is the perfect breakfast or brunch recipe for fall! This cinnamon french toast will jump start your fall season, and get you ready all that autumn has to offer! Start by making the compote. In a large, heavy saucepan, combine apple chunks, brown sugar, water, lemon juice, vanilla and cinnamon stick. Heat over medium-high heat. Stir with a wooden spoon until apples are well coated and sugar has melted. Keep warm. Heat oven to 200 degrees. Heat griddle to 350 degrees. While preheating, beat eggs, 1 tablespoon milk, nutmeg and cinnamon in a shallow baking dish or pie plate. Spray griddle with cooking spray. Working in batches of 4-5 slices, dredge sliced French bread in egg batter and place onto the griddle. Allow to cook on each side for 3-4 minutes or until light brown. Flip and cook on opposite side for 3-4 minutes. Remove to baking sheet and place in oven to keep warm. Repeat with remaining bread. Lastly, mix powdered sugar with 2 tablespoons milk. Mixture should be a glaze consistency and easily drizzle. Top French Toast with apple compote, powdered sugar drizzle and chopped walnuts.